Our banquet – a full weekend’s worth of fun and celebration! When people hear the word “Banquet” the first thing that generally comes to mind is a fancy dinner where you can dress up and have a meal with a few speeches from people and then everyone goes home. Now if you ask an 11 year old, would you rather put on a dress and listen to speeches or would you rather bounce on trampolines, ride ATV’s, go zip lining, sea-dooing and eat smores around a campfire? I don’t think one kid would be at that dinner! When you ask the ONDC what comes to mind first when you hear the word “Banquet” it most certainly does not involve a dress! Our banquet has become unparalleled to any other, and has always been an event to look forward to by our diving families. It is amazing to think back to 2007 when the ONDC began with two members in the club and to see what it has become today in 2018, 11 years later. 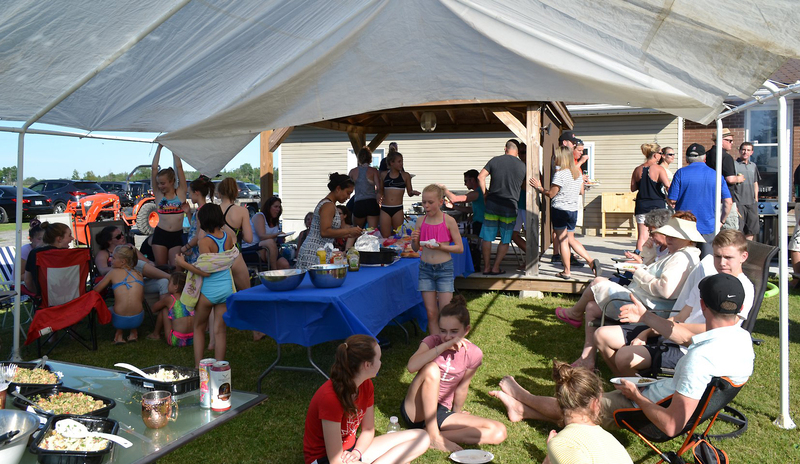 We have grown so big that we have had to move our banquet location out of Kathleen’s backyard by the pool to a beautiful property on multiple acres of land by the water. On this property we set the stage for a full weekend’s worth of fun and celebration! At 2:00pm our families begin to arrive to a day of sunshine and what will be our largest banquet to date! The divers begin to set up their tents and once everyone has arrived, got changed and headed to the lake for some swimming! 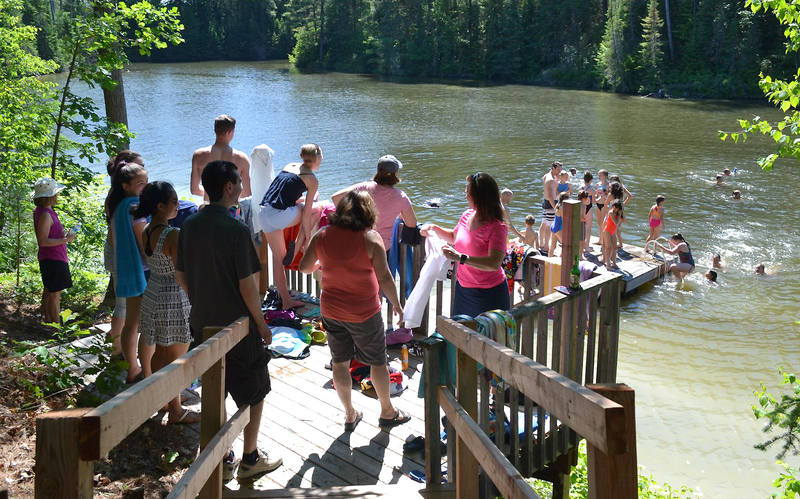 After a quick dip in the lake, it was trampolines, ATV’s and games until 4:00pm. Our Awards Presentations began at 4:00pm. We will do a separate post for our awards recipients to highlight their accomplishments properly. Following the awards it was dinner time with simple and delicious hamburgers, hotdogs and salads! After our family dinner you cant NOT have desert. So why not a Minion Piñata filled with candy to give them another burst of energy to go swimming, boating and sea-dooing? After a few more hours in the water it was time for some zip lining over the lake! Of course our youngest and fearless, 3 year old Nolan was the first to go! Once everyone had taken their turns it was time to return to the house as the sun had started to set. But why stop the fun there? Three simple items would get everyone pumped before the campfire. 1) Giant Tarp 2) Soap 3) Water. And thus the ONDC slip n slide was created! After wet and soapy slides and a few rounds of tag on the tarp everyone had hosed off and got into pyjamas for some good old campfire songs and smores. It was astonishing to find out that some of the divers had never eaten a smore before. That quickly changed when the smores veterans showed them the ropes. When the musicians needed a break it was time for one final game. “Don’t forget the Lyrics! Kids vs. Adults.” 1 point for the artist, 1 point for the song title and 1 point if you can continue the song after the music had stopped playing. I believe we ended in a tie as coach Mary might’ve helped the kids out a little bit too much! After 3 hours of good music and good company we were into the late hours of the night under a blanket of stars. At the stroke of midnight, the kids raced over and gave their dads HUGE hugs for father’s day. It was truly special moment to see so many divers do this at one time. It is times like these that I wished I had my camera to capture the moment. By 1:30am it was time to call it a night. At 8:30am it was time for breakfast and a team clean up. After helping to clean everything up, it was time for a quick swim in the lake and the diving version of “Cards Against Humanity”. Coach Brennan created a PG-13 version of the classic game featuring everything diving related and many inside jokes within our club. We had parents doubled over laughing and athletes in tears remembering all the jokes from the previous seasons. By 11:30am it was time to draw ONDC’s 2018 Banquet to a close. So when you ask someone from the ONDC what comes to mind when you think of the word “Banquet” you are now in the know – our banquet is a full weekend’s worth of fun and celebration!